Founded in 1902, 3M has grown into a billion dollar company by producing countless successful products. Their imaginative and innovative ideas has allowed them to give the world products we know and love. 3M is also committed to managing their environmental footprint by developing solutions that address environmental challenges and creating an overall sustainable company. They have recently turned one of their classic inventions green in an effort to produce more eco-friendly products. Scotch Magic tape was created in 1961 and still continues to make its mark in offices, homes, and schools. 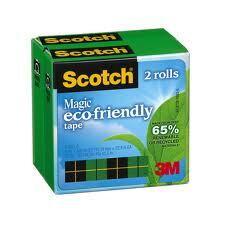 Now the magic in Scotch Magic Tape is its new eco-friendly qualities. The new tape is made from more than 75% renewable and recycled materials. Its packaging is also made from more than 65% renewable and recycled materials. 3M knows its users are looking for ways to lessen their impact on the environment, which is why they were excited by the launch of this new eco-friendly product. They also have other projects in the works to transform their products into more sustainable versions.